I need to start this post off with an apology to those who attended the presentation I’m going to describe below, as it has taken entirely too long to get this posted to my blog. After several years of teaching both full-time and adjunct, I recently decided to step back from that role for a bit and focus my efforts in some other places. 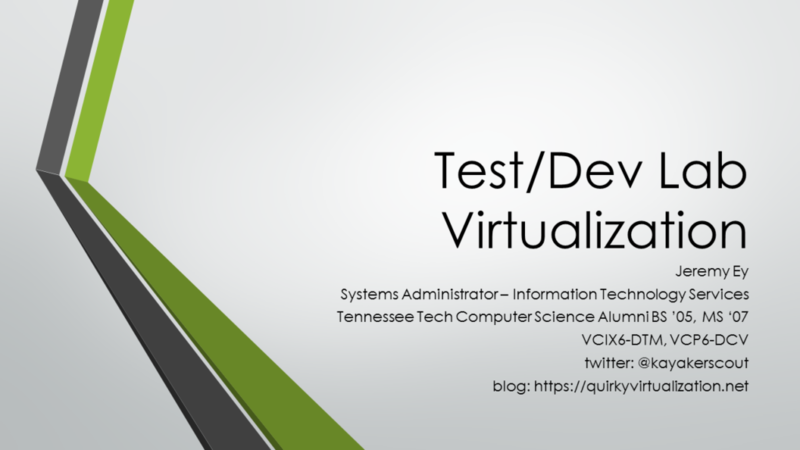 Both while teaching and following, I’ve had interactions with a small but steady stream of students asking questions about vSphere/ESXi or virtualization in general. One of the factors motivating these questions was their involvement in the CCDC cybersecurity competitions. What started as a discussion with Tennessee Tech’s Cybersecurity Education, Research and Outreach Center (CEROC) about way to make a positive impact in this area, culminated in an October 26th  presentation hosted by the student chapter of the Association for Computing Machinery. The hosting organization for this seemed oddly fitting as for much of my time as a student at Tennessee Tech, I was active with the ACM chapter, serving in leadership roles, and leading a workshop or two. I set out with an overly aggressive agenda to start with introducing VMware Workstation and build up enough information that one could get to the point of running a virtualized ESXi instance. This was probably further hampered by my presentation being put together a bit more last-minute than I expected and a delayed start while trying to address recording difficulties. The students who came by for the evening should be commended for dedication. For those that attended, or otherwise interested, the slides and a listing of resources follow below. Part of my delay in posting this involves the recording. Based on what I’ve viewed so far, the recording appears to have been successful, however I’d like to review the entire recording and clean it up a bit before posting. I’ll continue to work on this and post a follow-up entry when that is ready. Additionally, I know there were some topics that we didn’t end up addressing that came up, for each of those I’d like to either directly address the topic or provide some pointers to resources covering those topics. Clearly, for this amount of material, a couple of sessions would probably be a better idea. I did deviate from my plans a bit as the audience size allowed for a more interactive experience, which in addition to providing more value, saved some time. Hopefully these are all things that can be expanded on should the students be willing to have me back.